So many kids (and their grown-ups) have watched a poor battery-operated wooden train shake and strain and struggle just to get stuck halfway up a wooden train track hill. In the grinding of that little engine’s wheels, you can almost hear I think I can, I think I can, I think I can…even as it proves it’s really The Little Engine That Couldn’t. 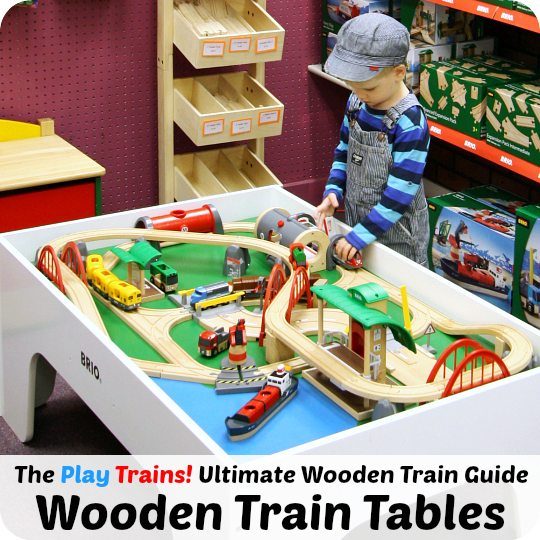 For years, “Are there any good battery-powered wooden trains?” has been one of the most frequent questions Play Trains! readers have asked me. For years, I’ve been giving the same answer: that in my experience, the Thomas battery-operated engine is the strongest, and the BRIO remote control engine is the most fun…but that there are many motorized trains I haven’t tried yet. And for years, I’ve been unsatisfied with providing that incomplete answer. What if there was some Holy Grail of battery-powered wooden trains out there, just waiting for me to discover it and share it with all of you? So I collected a pile of battery-powered wooden engines, loaded them up with brand new, fresh batteries, and put them through their paces. Before we get into the recommendations, there are a few things that I think are helpful to know about these battery-powered trains. Keep your expectations realistic. 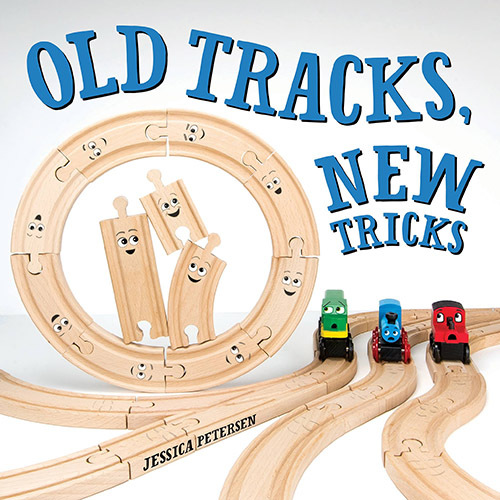 None of these trains are going to zoom around the track like race cars, and none of them are going to be pulling your toddler’s Cozy Coupe across the room (especially if your toddler is napping in it, like my son used to do!). 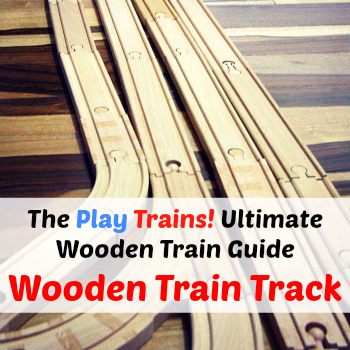 However, there are a few that are faster than the rest, and a few that can pull quite a few wooden train cars, even heavy, solid wood ones. The kind of track you have makes a difference. I recently read that the rough crosshatching in the bottom of the troughs where the trains’ wheels run on Thomas Wooden Railway tracks was added when they introduced the battery-operated Thomas engines, to allow them to grip the rails better. This makes a lot of sense. I’m looking forward to doing a comparison test, to see if that really makes much of a difference. One thing that does make a difference is when a cheap train track brand makes their short curved tracks just a little smaller than usual. Thanks to a reader bringing it to my attention, I discovered that the Fisher-Price battery-operated Thomas engines can’t go around the short curves made by the (not-recommended by me) Right Track brand of bulk train tracks, thanks to their wider-than-usual space between their front and back wheels. So sometimes things are the track’s fault, not the train’s. The kind of cars matter, too. I tested these trains with heavy, solid wood boxcars, but obviously if they’re pulling light, plastic BRIO freight or passenger cars, they’re going to have a much easier time. Make sure to check how many batteries you need, and whether they’re AA or AAA. Most of the trains take 1-3 AAA batteries, but some require 1-2 AAs. And then you need to figure in batteries for any remote controls as well. After my husband did some research, we got a twelve-pack of AmazonBasics AAA Rechargeable Batteries for this test, and used some freshly-charged Eneloop rechargeable AA batteries we already had for the engines that needed them. Even after my test runs, there isn’t one best battery-powered wooden train I can recommend above all others. But I did narrow it down to a handful of good options to pick among. I’ll go into the details below, brand by brand, but first here’s the short version of my recommendations if you want to quickly pick something to fit your family or to see which brand you’d like to scroll down to first. This guide was last updated on Thursday, September 13th, 2018. This post contains affiliate links to other sites. If you click on one, we may receive a small commission — at no additional cost to you — on anything you buy on those sites for a certain length of time afterwards. Read our disclosure policy for more details. If you want a good-looking steam engine with respectable speed and pulling power: buy the BRIO Mighty Action Locomotive. It came in third place for speed, it can pull several cars, and it’s BRIO, so you can trust the quality. The Little Engineer — my eight-year-old son — ranked this as his favorite of all the trains (slightly ahead of Thomas even), and he wants me to point out that it would make a great Christmas train to run around a track under the tree. If you like speed and control and don’t need the train to go under tunnels: buy an Imaginarium Power Rails train (we have the one from the Imaginarium Power Rails Cargo Station Train Set). It was the fastest in our tests, nearly tied with Thomas for pulling strength, and has a remote control with two speeds and a reverse mode. My traditional remote control suggestion isn’t nearly as fast or as powerful as this Imaginarium engine, but I can vouch for it surviving for years and we’ve always loved it. The BRIO RC Train Engine is cute and durable. The BRIO Remote Control Travel Train seems to be more or less the same train. If you’re buying for siblings or other kids who’ll be playing together, there’s a switch on each train and remote to switch between A and B channels, so two trains can be run at the same time. Plus the noises it makes are more pleasant. If you like (or don’t mind) Thomas: buy a Battery-Operated Thomas. He’s the strongest engine and decent in the speed area. Other Thomas Wooden Railway engines should be comparable (scroll down to see a list of ones I could find currently available). ETA: Be sure to read my newly-added warning below about battery-operated Thomas engines and tight curves…I need to do more testing but this is really a problem (and one that should’ve been discovered in play testing at the company). If you are buying for a toddler: buy the BRIO My First Railway Battery Train Set, which is rated for children 1 1/2 years and up (instead of 2 or 3+ years). The engine it comes with isn’t the fastest or the strongest, but it’s decent for what it is, and it’s very easily operated for little hands — just push down on the front of the train and it starts or stops. Also, it looks the most like a wooden train of any of the battery-operated trains…I did a bit of a double-take before I saw that it was all plastic. If you want to trick your child into thinking they’re getting screen time while they play with real toys: get the BRIO App-Enabled Train. It’s very similar to the BRIO RC Train Engine, but it’s controlled by a free downloadable app that turns your smartphone or tablet into a control panel for the train. If you want a small but cute little powered steam engine that isn’t a licensed character: buy the Hape Wooden Railway Battery Powered Engine. It was a little faster than Thomas in the tests. However, it doesn’t have nearly as much pulling power. More or less the same engine is available in two sets as well: the Hape Railway Battery Powered Engine Train Set (which is the same red engine) and the Hape Railway Battery Powered Rolling-Stock Set (which has what looks like a blue version of the same engine). We tested several BRIO trains out, and the best as far as speed and pulling power went was the BRIO Mighty Action Locomotive. This also turned out to be my son’s favorite of all the trains. It ranked third for speed and in the middle of the pack for pulling power, but I think its appealing appearance set it apart for him. One of the two trains I’ve been recommending for years (along with Battery Operated Thomas) is the BRIO RC Train Engine. We’ve always found it to be a fun train, and while it’s not as fast or as strong as the Imaginarium remote control train, it’s a lot prettier and it fits under tunnels. TheBRIO Remote Control Travel Train, White seems to be a very similar train. You can set a switch on the remote control and the train to have them connect over the A channel or B channel, so that you can have two of these trains running at the same time. We’ve had ours forever, and it was running great during the tests. We had fun testing the BRIO App-Enabled Train. 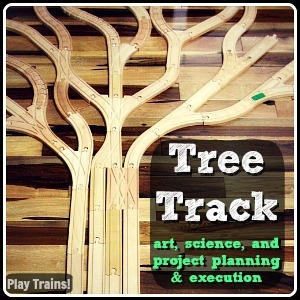 It’s a fun and unique train that you control through a free app on your smartphone or tablet. It has a blue and silver paint job and a detailed, high-tech, electric train look. The app lets you gradually raise the speed, stop the train, put it in reverse, turn the lights on and off, and blow the horn. I prefer the physical remote control in the previous train because you can operate it without looking away from the engine. But for some kids who need to be gently transitioned into spending more time away from screens, this train might be worth the higher price. I also bought a BRIO Travel Rechargeable Train to try. I have yet to get it to finish charging (even after several hours) and turn on. An Amazon review says that it takes all day to charge, so I’m going to plug it back in and leave it overnight. Maybe I’ll get it to work yet. Otherwise I’ll try to return it and see if I get a better one. The reviews for this train are fairly positive, and if you do get one, apparently it’s a good idea to charge it in advance of giving it as a gift! The BRIO Travel Battery Train isn’t super fast or strong, but it’s one I like because you can put a little BRIO engineer in the front of the engine. 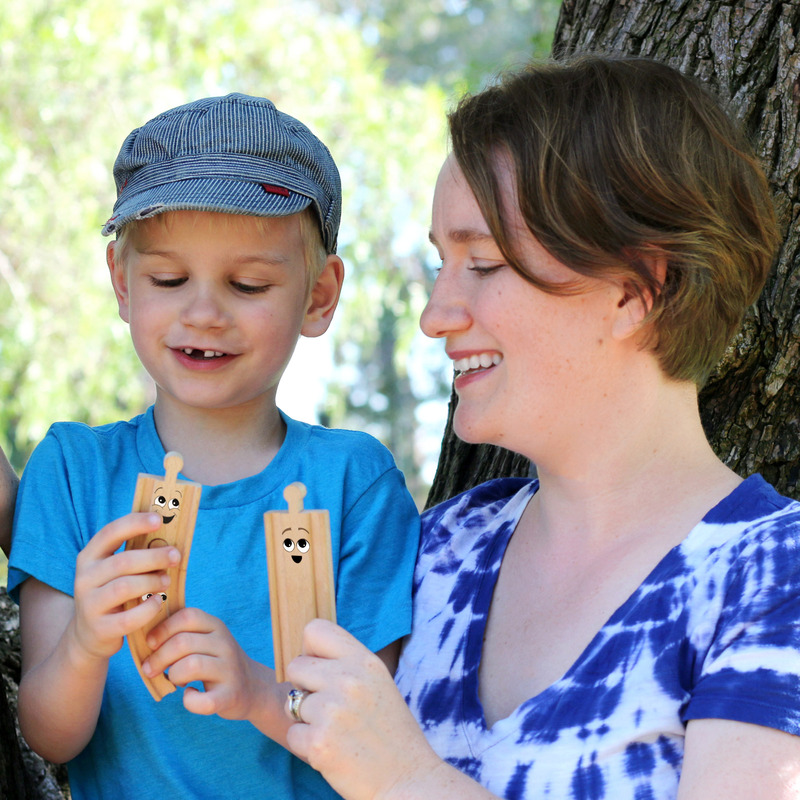 It also comes in the BRIO Travel Switching Set, which is a set that we’ve owned and enjoyed for years. BRIO battery engines I don’t recommend: the switch on the BRIO Freight Battery Engine is difficult to operate (assuming it’s the same as the one we’ve had for years). I like the BRIO Steam Engine Set but the engine itself isn’t worth seeking out if what you really want is a battery-operated train. BRIO battery engines I don’t have experience with yet: the BRIO Battery Powered Engine Train, Green and BRIO 2-Way Battery-Operated Engine, Yellow (which I think are the same except for color), along with the BRIO Battery Operated Action Train that’s the same engine with some rolling stock included. ETA: Last year, Fisher-Price/Mattel replaced the Thomas Wooden Railway with a line called Thomas & Friends Wood (I’m working on an article about this unfortunate change), so I don’t know how long these battery-operated Thomas trains will be available. If there are any that you think you’ll want to buy eventually, you might want to buy them now. Fisher-Price Thomas Wooden Railway Battery-Operated Thomas proved to be one of the overall best choices — assuming your child likes/loves Thomas (and you like/love/don’t hate him). Thomas was the strongest engine in my tests, pulling 11 solid-wood box cars up a slope. In general, his weight and his grippy, four-wheel-drive wheels make him the best at going up hills, even steep ones, and he doesn’t slide down the slopes going down. ETA: A reader has brought it to my attention that the Fisher-Price battery-operated Thomas engines can sometimes get stuck going around the short curves of Thomas track (and possibly all other types of short tracks…I’ll need to do a lot more testing). In my attempt to recreate that, I had to have the curves flexed tight (using the play built into the track connections) to get it to happen, so if you already have a Thomas engine and you’re having this problem, it may help to build your track layouts in a way that allows the short curves to fit into the track in an even curve or one that flexes outward, or if you have enough different tracks, you could avoid using short curves altogether. (Testing this out, I also discovered that Thomas will drive off the edge of Thomas & Friends Wood curved tracks, which are a weird new size and length between traditional short and long wooden train track curves.) But this really makes it hard to recommend these engines as highly. The Learning Curve battery-operated Thomas engines, which we played with quite a bit back in the day, never had any problems on the short curves. The difference that I can see is that the Fisher-Price Thomases have a slightly wider space between their front and back wheels than the Learning Curve ones did. We’ve owned a Learning Curve Battery-Operated Thomas for years, which is the engine I based my original recommendations of battery-operated Thomas on. Sadly, even when I replaced his battery today, I couldn’t get him to turn on. But one that hasn’t been sitting around with a forgotten battery in it for years would probably be a good choice, if you run across one. ETA: Toys’R’Us — which sold the Imaginarium toy line — is no longer in business (in the US, anyway). The trains are still available from other sources, however, and I’ve changed the links below to reflect that. Once a product is no longer being sold by the original company, it’s always important to be sure to evaluate the prices to make sure you’re not overpaying for what you’re getting! Another one of the best overall battery-powered trains was the engine from the Imaginarium Power Rails Cargo Station Train Set. This is kind of an unusual set — it comes with plastic track that’s compatible with wooden train track — but if you don’t mind the plastic, it’s kind of cool. The engine was by far the fastest of the trains we tested, and it was able to pull several solid-wood box cars up the ascending track. The remote control has two forward speeds, stop, and reverse, as well as a button to blow the diesel engine’s horn. Other than my son not liking some of the sounds, he really enjoyed playing with this train and the tracks that came with it. 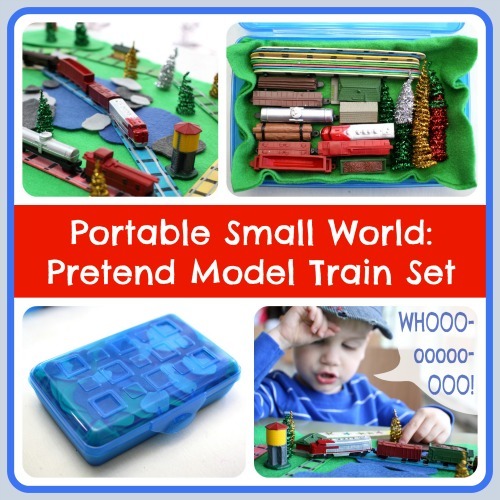 They were a fun novelty to him, and they’d be great for taking train play into the outdoors. Plus, this train was seriously speedy in comparison to the other ones we tested. Only the Bigjigs Flying Scotsman came close to its speed. There are other sets in the Power Rails line — the Imaginarium Power Rails Saw Mill River Train Set and the Imaginarium Power Rails Gold Mountain Train Set. You can buy an engine and freight cars set — Imaginarium Power Rails RC Engine Pack — on its own. I assume these are all similar to the one we tested, but I haven’t confirmed that. 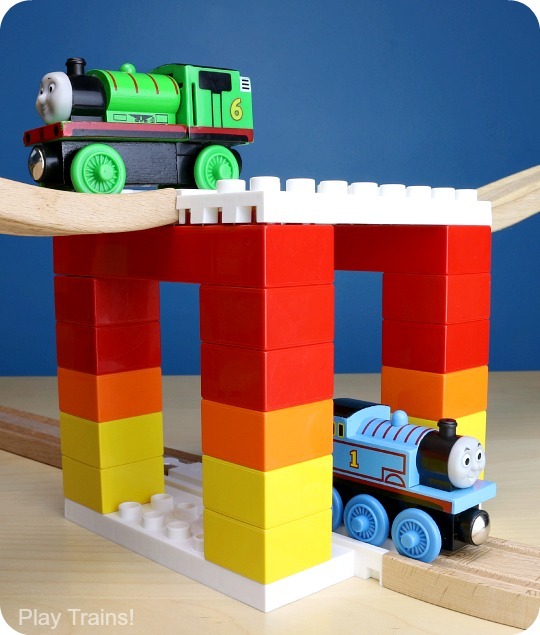 Note: there are were some negative reviews for the Power Rails sets on the Toys’R’Us website…I think the people leaving them don’t understand that wooden train tracks — even if they’re plastic — don’t snap together and stay put. So far they’re behaving as expected for us. Other Imaginarium battery-powered trains: I don’t recommend the Imaginarium Express Power Steam Engine Train Set. Our original one from years ago stopped working, and the new one I bought to test was very weak. I haven’t had a chance to try the Imaginarium Remote Control Train Set yet…the Power Rails one looked more recent and interesting when I was gathering test trains. The second fastest train was the Bigjigs Rail Flying Scotsman Battery Operated Engine (or the presumably identical-except-for-color Bigjigs Rail Big Red Steam Battery Operated Locomotive, which may be easier to find depending on where you are), and it was downright zippy! The unfortunate thing was that the coupler on the one I bought seems to be missing its magnet, so it couldn’t really hold onto any boxcars on the hills. Which is a shame because it had a good amount of power — I stuck a strong magnet to its coupler to to test this — although on very steep hills (a.k.a. three level ascending tracks), because it tips backward on its driving wheels. I’ve contacted the company and I’m waiting to hear back from them, but I would read the Amazon reviews if you’re interested, because people seem to like this one. Hopefully mine just slipped through quality control or something. ETA: I got a replacement Flying Scotsman from the company, and the magnet is better. I haven’t fully tested it yet, but just hanging freight cars from it vertically in the air, it seems like it would fall on the lower end of magnet strength in comparison to these other engines, but it will pull a few cars. So this might be a good option if you care more about speed than pulling power and want something that looks nicer than the Imaginarium Power Rails train. ETA #2: You may want to read this reader comment below regarding this engine…it sounds like there may be further problems with it (and their customer service, which is sad to hear). The Bigjigs Rail Battery Operated Train Engine was really slow and pretty weak, so I wouldn’t recommend it or the similar Bigjigs Rail Pink Battery Operated Train Engine. The Hape Wooden Railway Battery Powered Engine came in fourth as far as speed goes, just ahead of Thomas. The Hape engine doesn’t have Thomas’ pulling power, but it can pull a few cars, seems well made, and is pretty cute. I like the easy-to-operate switch on top of the train. It’s also available in the Hape Railway Battery Powered Engine Train Set, and what looks like the same engine, only blue, is included in the Hape Railway Battery Powered Rolling-Stock Set. The Hape Kids Wooden Railway Propeller Steam Engine is certainly unique with its spinning propeller! I found it after I’d finished buying trains for this test, but I may pick it up in the future, just because it’s weird and unusual. 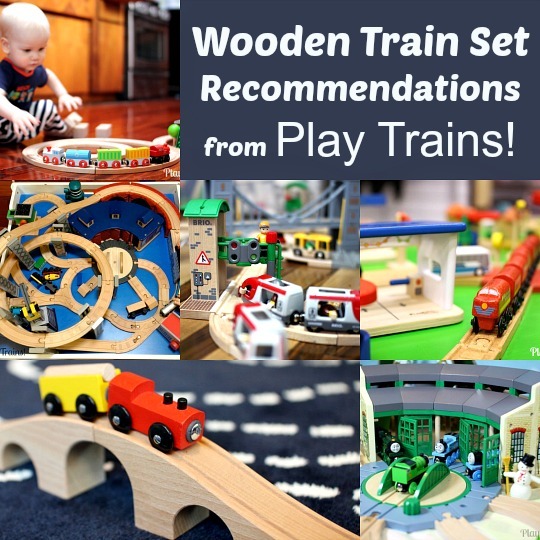 Most wooden train sets are rated for age two or three and up because of these dangers. Please take this into account when buying a trains set for your children, as well as their own stage of development when it comes to putting things in their mouths. We were fortunate that the Little Engineer was beyond the mouthing stage when he was only one year old, so we were able to buy wooden trains from the start of his interest in them. Even so, I did put a number of smaller pieces away until I was sure, and I always closely supervised him with his trains. I’m really disappointed that battery powered Thomas trains get stuck on the tight curves sold in Thomas sets etc. It seems to be caused by the metal playing on the inside of the wheels on the undercarriage. I was going to try and grind it away but I suspect it is there to stop the train wheels from climbing out of the track groove. I might try a Brio engine before I give up. Oh no! I knew that was a problem with Thomas engines and Right Track brand track, but I hadn’t encountered it with Thomas track until just now when I pulled some out to try to recreate this. It took a while, though, for me to see it…for me, I had to have the curve of short tracks flexed tight and then Thomas and Percy got stuck (they made it around okay as long as it was set up carefully to be an even curve or set up to flex the curve outward a bit), but I’ll need to pull out more short curves from more Thomas sets to see if the track has also changed significantly enough to make it even worse for some Thomas tracks. I also found that Thomas drives over the side of the new Thomas & Friends Wood tracks sooner or later when you have him go around and around in a circle. I was already planning to do a lot of testing with a lot of different track brands when I have time to do my more extensive test with these trains, but obviously I need to do even more than I was expecting. Do you know which set (or era of Thomas sets) your tracks came from? Back when I tested the Right Track problem, it seemed that Mattel/Fisher-Price had put the driving wheels slightly farther apart than Learning Curve had on their battery-operated Thomas engines, and something about that was getting them stuck on the Right Track brand short curves (pretty much every time with those tracks). Anyway, thanks for letting me know, and I’m sorry the engine is giving you problems (especially if you bought it on my recommendation). And if you want me to try a specific BRIO engine with some Thomas curves before you buy it, let me know. I think I should leave a word of warning about the Bigjigs locomotives. We bought the Flying Scotsman for our 5 year old grandson, and after about 20 minutes play the gears failed and the wheels stopped rotating, though the motor and sounds were still operating. I wrote to Bigjigs but had no reply. Looking for reviews online, I have noted that this is a common failing with Bigjigs locos, so there is obviously a design fault in the gearbox. As you noted, the magnet is also weak, compared to Brio products. I must say, compared to the very strong and durable Tomy Trains locos I bought for my son 26 years ago, and which still work (! ), ALL the current battery locos are of very inferior quality and performance. Ah, thanks for writing! Bigjigs was responsive to me, but I didn’t conceal the fact that I was working on a review (I was hoping they could get back to me before I posted the article when I originally emailed them). It’s a shame they haven’t gotten back to you. I really wish someone would make a battery engine I could wholeheartedly say was awesome. Okay, I’ve updated the post above in light of your comment…thank you again for writing.